As the 'Troika' of the EU, ECB and IMF return for a third review of how we are implementing our bailout terms, RTÉ's Economic Correspondent Sean Whelan assesses what they should find. 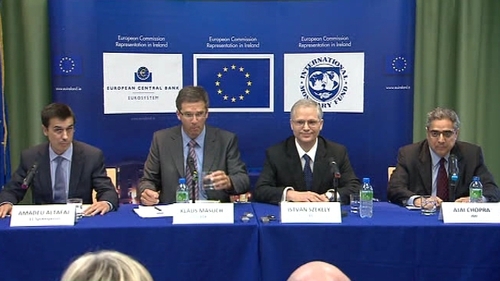 The third review of the EU-IMF programme for Ireland starts today. It is not the toughest review the Government will face, nor the most testing for the EU-IMF teams, who have a lot on their plate dealing with Greece and Portugal, and who might welcome a relatively straightforward visit to Dublin. The review is scheduled to wrap up by July 14. The revised memorandum of understanding between Ireland and the lenders - drawn up during the last review - has three pages of conditions to be achieved in time for this review, and a quick run through them shows that pretty much all the boxes have been ticked. Most importantly, Monday's half-year Exchequer returns show that the state's finances are on track, and the EU-IMF's target for a primary deficit (borrowings before interest on loans) was comfortably met. The lenders wanted a primary deficit of €10.1bn maximum, while the actual out-turn was €8.4bn. The Troika also want an update on the restructuring and deleveraging of the banking sector. This involves reducing the amount of money the banks have lent out as a percentage of their deposit base from an average 177% to an average 122%. Here, the Government can point to the mergers of AIB and EBS, Anglo Irish Bank and Irish Nationwide (now to be known as Irish Bank Resolution Corporation), the division of bank management teams into core and no-core business areas, and the placement for sale of €10bn worth of Anglo's US assets, as well as the sale of a few small business units by other banks. The recapitalisation of the banks is also moving towards the deadline of the end of this month, and the Government can demonstrate actual burden-sharing by subordinate bondholders, particularly in AIB, Bank of Ireland and Anglo Irish Bank. On financial supervision, the Troika required a new bill giving extra powers to the Central Bank to be tabled in the Dáil. That was done last week. They also required legislation to progressively raise the pension age to 68 by 2028. That has also been tabled in the Dáil. The agreement required the Government to establish a fiscal advisory council - a group of economists who would independently review and comment on government tax and spending plans - by the end of June. That council is almost established, with a last-minute hitch in recruiting the final member of the council holding back its announcement. And that is, essentially, that. Will reviewing that really occupy the team for eight days? Unlikely. Once the formal work is out of the way the teams are likely to start preliminary talks on the next review, scheduled for September, which will be a much tougher affair as it will lead in to the Budget. They will also want hard decisions taken by September on a number of controversial topics which are in Memorandum of Understanding, such as the reform of the Registered Employment Agreements and Employment Regulation Orders. They also want to see measures to introduce competition to get prices down in the medical legal and pharmaceutical sectors. But the big fight in the autumn will be on the memorandum's call for tax raising measures to raise €1.5 billion in extra revenue, and spending cuts of €2.1 billion, including social protection cuts. As the Taoiseach and Tánaiste stated on the 100th day of the new government, there will be no income tax rise nor cuts to social welfare rates, the EU-IMF team will be keen to know how the Government intends meeting the agreed targets. That will be one of the big topics of discussion in this review, aimed at discovering Government thinking rather than getting hard plans. Those plans are dependent on the outcome of the Comprehensive Spending Review, which is underway in all government departments, and which is the subject of a number of government meetings this month, as Brendan Howlin tries to push ministers for early decisions on spending cuts ahead of the formal spending round for Budget 2012 in September. Those decisions in turn will be a big part of the September EU-IMF review mission, which is why marking out the ground is important for this review. The Troika seem keen that the Government start talking about their plans in public, getting people used to what is coming down the tracks, and helping to reduce the uncertainty that - in the view of many commentators - is holding back consumer spending, which in turn in weakening the economy. But to do that the Government first has to make decision on exactly what it is going to do over the next year. As the next Budget is the first one the new government will make, it has to establish its own political parameters, which will set the tone for the years ahead, particularly in the balance between tax rises, spending cuts and job creating stimulus packages. With so much at stake, and so much to be established over the next three months, it is probably just as well that the formal part of this review won't be too demanding on either side.